For you cold smoke lovers; how about this idea; clean out the egg, and throw chucks of hickory in and just light that. Wouldn't four or five chunks burn low but give of plenty of smoke? I'm trying to get all my ducks in a row for my first bacon. Thought that might work. No. Burning hickory will be a fire. Fire = hot which is bad. Also, burning hickory does not produce the smoke you want. It's smoldering hickory....which is exactly what the AMS does. Smolder, not burn. How long do you intend to smoke? Going from fridge to those ambients would still give you a good window before freezing. Even if it starts to freeze it will still absorb smoke. You could split it up into two or three shorter smokes? Historically, that is how cold smoking has been done. I was thinking on doing at least 8 hours and then start to check and see if I get the color/smokiness I'm looking for....figuring it might go 12+hours... Thanks for advice! For my first run of cold smoking bacon, ambient was right at freezing 32*F. Smoked for almost 12 hours and there was no color change. From what I have learned at these temps, we may not see any yellowing like you would expect. Far from a pro at this, just giving you a heads up. no color change here either when I go cold smoke. Even at 60 ambient temp. I just pulled 5 slabs of yesterday. Looks just like raw bacon. I'll take a pic. I got quite a bit of color on the last cold smoke, pellets definitely burn hotter and more smoke than dust. I'm going to grind some of my pellets and make dust to try next time. OK, so a number of you prefer the cold smoke vs. hot smoke because why? The texture is soft and more like store bought bacon before it's fried in a pan or oven? Any other reason? If the taste is significantly better than hot smoke, OK. But if the end product is about the same, why go through the long smoke process? If it's firm from the hot smoke, then that's the way it is, right? If I want an end product that's like store bought bacon, then I'd just go to the store. Isn't the whole purpose of this exercise is to make bacon that's better than store bought? Maybe I'm over thinking this. Excuse my ranting. Coffee has just kicked in. Thanks for any advice. I originally planned to do a side-by-side comparison but I am pleased with the end product of cold smoke. I may try a hot smoke down the road? With a hot smoke, you are essentially cooking it twice. Once to 150*F, and then frying in a pan. Cold smoking is done at temps < 75*F. Your product starts to cook if your temp is higher. IMHO, a better flavor depth would be created with a lighter, longer cold smoke vs a shorter, heavier hot smoke. Even though the end product's texture before cooking is similar to store bought, the flavor and texture of cold smoked bacon after cooking is so much better. It is worth the extra effort. From what I have gathered, if you prefer thinner slices, the cold smoked belly is easier to slice. Parfreeze for 20-30 minutes and slice away. I had the same thoughts as @500. Without a slicer, is hot smoking easier to slice since it is more firm? Or will freezing the cold smoked bacon briefly achive the same firmness before slicing? If both easy to slice, but cold smoking tastes better, then I will go with that. If they taste the same then I will go with hot smoking. I will prob get a whole belly, split it and try both and do a comparison. 1/8" slices with a 9" slicer, no problems. After researching the vets and their comparisons, I decided to abort the hot/cold smoke experimenting. I know CT has done an actual side-by-side. Maybe he can help? It's not the same finished product. You are cooking it twice and it is much more chewy and firm when you hot smoke. it's still really good but it's not the same as the bacon you are used to. It's more the texture than the taste. As far as wanting bacon that's like the store, I'm talking texture only. The taste blows store bought bacon away in both cases. I've done both ways and agree with C-T 100%. It's all about taste! Alright, I can see the taste benefits, for sure. Texture is important also. I would want it to crisp up in the pan or oven when fried. A hot smoked one doesn't get crisp? I'm trying to get this right the first time, cause I have a critical crowd I'm feeding; two "tween" daughters and a wife. Their palate has become very keen when it comes to my Egg cooks. I get, "It was better last time." They are very keen to the amount of smoke in something, to the point that I am doing less and less smoking woods in the cooks, and just using the smoke taste from the lump. they are both great so you can't go wrong. I'm just saying that I think cold smoke has better texture. You can put a ton of smoke on bacon without it being overpowering. I would try 4-5 hours and see what that does for you. I use apple wood so it's more mellow and goes perfectly with pork. I go like 12-14 hours and I could go more without any problems. As far as getting it right the first time, you should do both and see what you like. I did both and they both got devoured. We just preferred the cold smoke over the hot so I do it that way exclusively now. It's not like the hot smoke got sent back or anything. it's really good too. 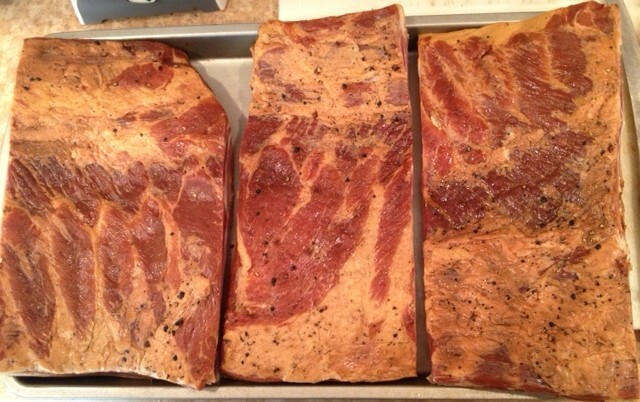 Hickory, Maple, Cherry, or Oak for the first run of bacon? I got package #3 from A-Maze-N Smokers and got 2lbs of each type of pellets along with the smoker and torch. $75 with shipping. Going to get some apple dust as well. do the maple cured smoked bacon from 'Charcuterie' and use maple for smoke...It's awesome! Wonder if smoking on a mini would be too smokey. Well, I guess the AMS wouldnt fit in there anyway. Anyone try? I am assuming that you are buying pork belly for the bacon? 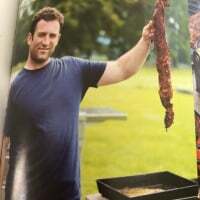 I can't seem to find a butcher shop that can get it for me. You can make bacon out of pork shoulder, that is what I did. Yeah, that is the plan. Think that price is reasonable for belly. I have heard anywhere from $1.69 a lb to $6.00 depending on where you are. $3.00 is my local price from my butcher. Finally found someone about 45 mins away. $2.57/lbs and it comes in 8-10lbs packs. SWEEEET!!! Nice. Sounds great. 10 lbs is perfect. Split it into 2 five lb bellies and try 2 different cures. Good luck! I found a source at a local butcher HERE. It's $6/pound for uncured belly. They cure bacon in-house and sell it for $13/pound. Pricey, but I bet it's good. @CT, @Focker, @MQ, did you guys turn the bellies daily or every other day? Got them curing finally. Got Charcuteries maple cured and a savory blend going. Just under 5lbs of each. 10:4. That's my plan. You think I could get away with a 6 day cure and a day in fridge for pellicle so I can cold smoke Sunday (week from today)? Or need to go 7 days. One side of one of my bellies is pretty thick. First one i did was firm at 6 just did one cold smoking now it took 7. The thickness is definitely the determining factor you can't rush the chemistry of it. Yeah, it's done when it's done. It'll feel firm and you'll just sort of know its ready (you will, trust me). Might be 5 days, might be 8 or 9, depends on the meat. If it's thicker, you will need to cure longer. I cure for two weeks regardless of the size. Takes the guesswork out of things and it's better than undercuring. Some bellies may not firm up when cured, fat varies with each piece. The max I've heard people cure bellies is 20 days. If you decide to cure longer, post cure soak for a couple of hours in water, changing the water as needed. Then dry overnight in the fridge to form pellicle and smoke the next day.